Kids who write and send letters to Santa want to know if their wish list reached its intended destination. 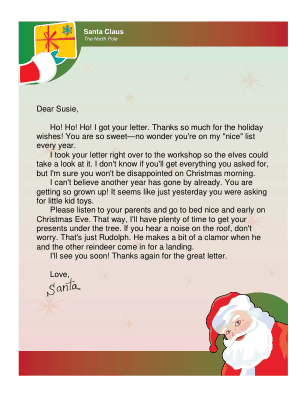 This letter assures the child that the letter was received and the requests duly noted by Old Saint Nick. Ho! Ho! Ho! I got your letter. Thanks so much for the holiday wishes! You are so sweet-no wonder you're on my "nice" list every year. I took your letter right over to the workshop so the elves could take a look at it. I don't know if you'll get everything you asked for, but I'm sure you won't be disappointed on Christmas morning. I can't believe another year has gone by already. You are getting so grown up! It seems like just yesterday you were asking for little kid toys. Please listen to your parents and go to bed nice and early on Christmas Eve. That way, I'll have plenty of time to get your presents under the tree. If you hear a noise on the roof, don't worry. That's just Rudolph. He makes a bit of a clamor when he and the other reindeer come in for a landing. I'll see you soon! Thanks again for the great letter.